AS-3, lets call it as Cyclone "Luban"is located at 12.5N and 61E, and with estimated core pressure at . Core is wrapped with a defined circulation,and estimated winds at 45 knts-55 knts. 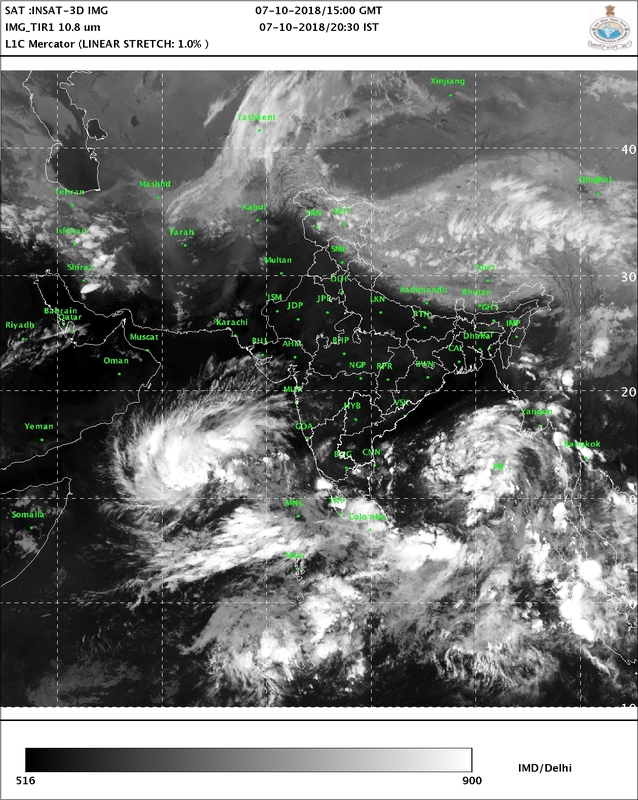 Two prominent STRs exist,one North east of the System over NW India, and another North West of the system over Saudi Arabia. The second STR becomes dominant and prevents the cyclone from going Northwards (which we said could happen) and will track towards South Oman/Yemen. Due to the above track changes, chances of some rain over Mumbai diminishes. 1/2 degrees drop in day temperatures expected. BB-12, now a depression,is located at 14.3N and 88.2E. Tracking NW towards Odisha/W.Bengal coast. Favorable conditions for further strengthening. NW and N/NW movement will pull moisture away from coastal TN. As mentioned, Monsoon has not yet withdrawn from Karnataka Southwards. Vagaries has not announced any date for NEM commencement. 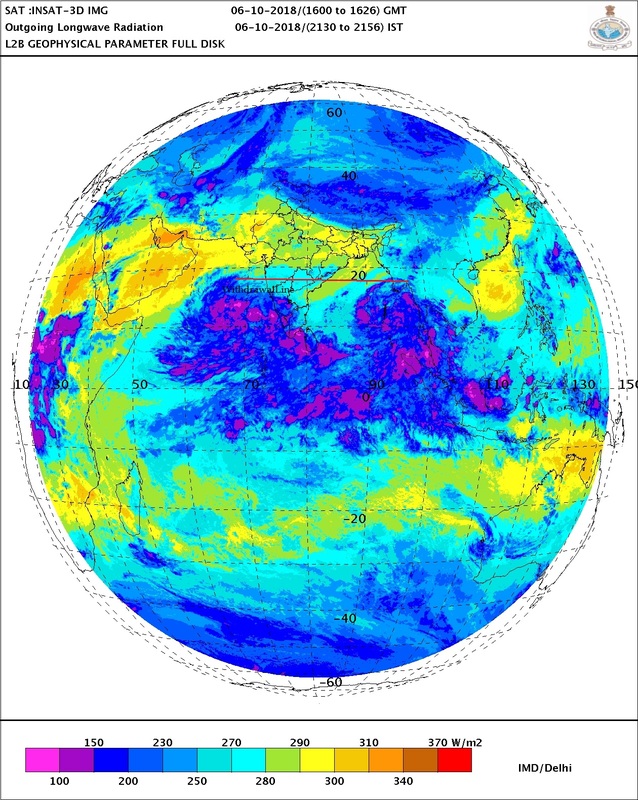 -A WD is moving in,bringing rain and snow to Kashmir and HP, ushering in early October "heavy snowfall"
AS-3,Deep Depression latest at 12.3n and 64.3E. Estimated winds 30 knts and estimate pressure 1000 mb. and AS-3 could track W/NW towards South Oman. Mumbai: Chances rain from Outer bands still possible for Tuesday/Wednesday. Bay Low has formed, and is steering towards Odisha Coast. STR sems may prevent Southward track. SouthWest Monsoon withdrawal will be stagnant for another 24 hrs. 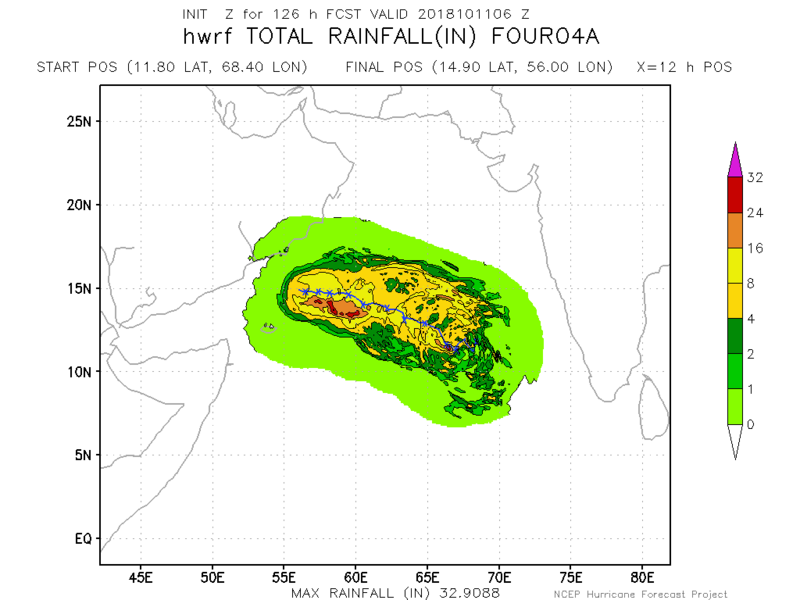 Depression formed in Arabian Sea, AS-3, located at 11.3N and 66.9E. Estimated core pressure at 1000 mb and estimated winds at 25-30 knts. System will track NW and intensify into Cyclone "Luban" by Monday. Will head towards Oman.Likely to reach Oman coast Tuesday/Wednesday. Strong winds and rains likely in South Oman from Tuesday. 6th October, South West Monsoon has withdrawn from Mumbai and withdrawal line shown below. Withdrawal likely to be halted South of Goa for 2 days at this point . Mumbai will be hot and dry (37c) on Sunday 7th and Monday 8th. On Tuesday 9th and Wednesday 10th, the outer bands of Cyclone Luban may bring some medium showers to Mumbai. And along the Konkan coast. A Low likely to form in East Central Bay around 8th. But this may not effect the Eastern Coast of India. Sir what will be winter forecast for north india, gujarat and mumbai. Past some years winters are warmer and this year we have El Nino. When would night trmperature start falling in mumbai..
Serious impact on North east monsoon - missed 3 lows which are phenomenal rain! During last phase BB-11 went to Orissa,central India,Northern India, AS-3 Oman,GUJ, BB-12 expected again to North east India- Orissa. I feel repetition of 2013 - serious drought hit TN,AP,interiors of KAR - missed all lows during oct-dec.
Is Oman a desert or undergoing climate change phenomenon ? Lucky Oman 2 cyclones to hit in span of 4 months! May 2018 Cyclone Mekunu dumped 600-300mm of rains widespread - multiple days and now cyclone Luban. Should have at-least hit TN/AP. (I am disappointed). is Imd changing criteria of NEM onset which was not declared before 10th October? Vinod Desai: Mumbai will be hot and warm now. Expect below 20c in November.North should expect early winters from end October. As soon as these systems make the WD effective. Ravat: No,I dont think any norms changed for NE Monsoon. 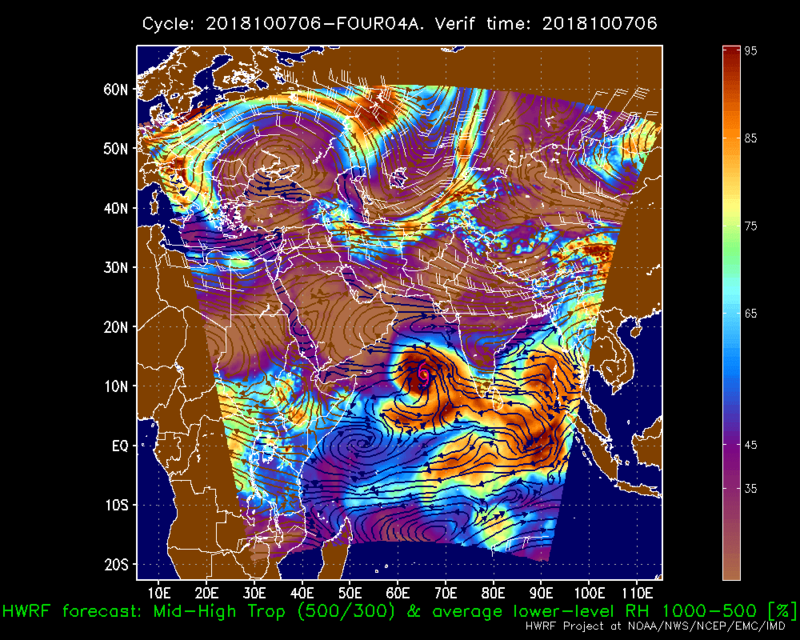 Useless rogue Bay and Arabian low pressures which have dismantled North east monsoon... south east india is becoming drier and drier. Due to the above intense systems, the wind regime has changed over the Bay of Bengal and adjoining Sea areas. As a result, the rainfall activity is very likely to decrease over south peninsular India from tomorrow onwards. Hence the commencement of northeast monsoon rainfall over Tamilnadu & Puducherry, Kerala and adjoining areas of Andhra Pradesh & Karnataka is not likely to take place as assessed earlier. Development of favourable conditions for northeast monsoon will be closely monitored and its commencement over Tamilnadu will be assessed after the life cycle of the cyclonic system over the Bay of Bengal. After this western disturbances will start giving rains to Northern India again problem for NEM onset. It is unbearable heat in mumbai. Summer was better than this weather. Seems ElNino has taken away all rains and now there will be no winter as well.. even if no ElNino winters are becoming warmer every year. Our ENSO Outlook provides up-to-date information on the likelihood of an El Niño or La Niña developing. The Bureau's ENSO Outlook has been raised to El Niño ALERT. This means there is approximately a 70% chance of El Niño occurring in 2018 – around triple the normal likelihood. Similarly, in the Indian Ocean, a positive Indian Ocean Dipole (IOD) may have started. When combined, these two events in spring increase the possibility of a dry and warm end to the year. It also raises the risk of heatwaves and bushfire weather in the south, but reduces the risk of tropical cyclone activity in the north. The tropical Pacific Ocean has warmed in recent weeks due to weakening of the trade winds, while the Southern Oscillation Index has fallen to typical El Niño levels. Models suggest further warming of the Pacific is likely. Four of eight models predict El Niño thresholds will likely be exceeded in the coming months, with another two falling just short. In the Indian Ocean, there are signs that a positive IOD is currently underway. The IOD index has exceeded the threshold (+0.4 °C) for the last four weeks. However, these values must persist until November for it to be considered a positive IOD event. Model outlooks suggest positive IOD values are likely to continue through the austral spring, before returning to neutral values in late November to December. @Vinod Desai, I think what is really making things miserable in Mumbai is the very high levels of Humidity, even though the Monsoon has withdrawn couple of days back, the humidity levels continue to be very high. I think the humidity continues to be high due to Cyclone Luban which is throwing moisture over the coastal areas.